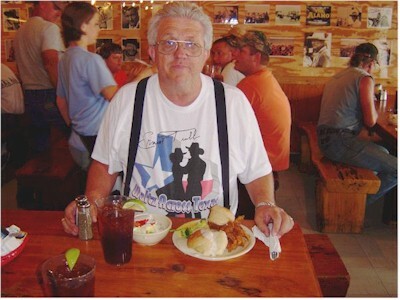 If Bandera, Texas is the Cowboy Capital of the world then the Old Spanish Trail (OST) Restaurant in Bandera has to be the cowboy restaurant of the world. 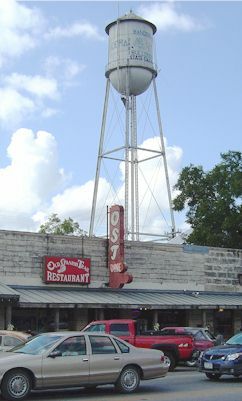 I pulled my pickup into a tight parking place right in front of the OST Restaurant on Main Street. The angle parking was full of pickups. Not you run of the mill suburban pickups but working trucks, heavy duty trucks, rigged to pull stock trailers not to haul bags of peat moss and lawn fertilizer. All with gun racks sporting constitutionally protected firearms and lariats. There was steady stream of hungry diners going in the front door and places to sit were running low. This is the kind of place that is so busy at meal time you may end up sharing a table with folks you don't know, but that's OK, socializing was not the main thing going on at 12 noon. You could see that eating was the serious business at hand. We found a spot at the end of a long rustic table. There were enough chairs for about eight other people and we were first to sit down. A very busy waitress came by took our drink order and gave us the option to order off a menu or join most of the diners at the buffet line. I asked, "What's on the buffet?" "All you can eat homemade chicken strips and cream gravy." She also told us all about the vegetables and side dishes, how much it cost etc., but all I heard was "All you can eat homemade chicken strips and cream gravy." I immediately headed for the end of the line. It's the one time I wish the plate had sideboards. I started down the line, mashed potatoes, cream gravy, and then I got to the "homemade" chicken strips. I could tell these chicken strips were hand cut. They didn't look like they had come from square chickens and extruded through a machine. These chicken strips were fat, skinny and irregular in shape and size breaded and deep-fried. I piled my plate so high that when I got my broccoli with cheese I accidentally knocked a piece of chicken, shaped like cowboy boot, on to the floor. I longingly looked at it and knew that good manners prevented me from picking it up. The food was good, real good. I didn't go back for more because I was pretty full and I had my waistline to consider. I took a moment to look around and decided that I must be in "The John Wayne room". 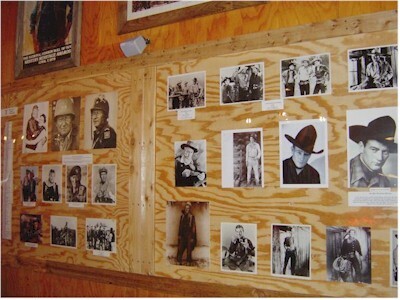 There were hundreds of pictures of "The Duke" covering the walls. That's when I spotted the most unusual bar I have ever seen. Unusual because the bar stools were saddles. 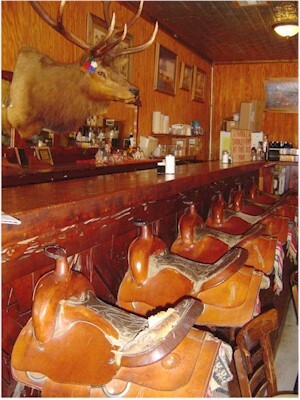 I guess after spending the day in the saddle it would just make sense that you could sit the bar on a saddle for some liquid refreshment. I headed out he door thinking maybe I should have picked up that boot.